so i just want to make sure and check if the radius of the bar (cyan in color) is correctly the same as your idea. I'm not sure that understand your issue. Please clarify - did you already drawn that sketch or need to draw it? 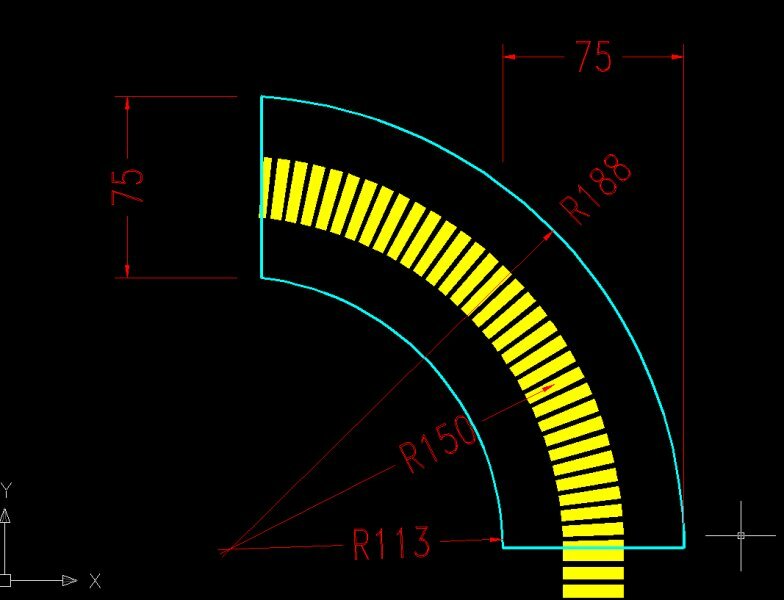 The yellow part is a dashed entity or a set of thicker polylines drawn perpendicular on an R150 arc? alright, attached image was my sketch. yellow polyline is 25mm diameter so i set the width to 25, the next step i did was to offset that polyline half of the diameter of the pipe (color cyan); 75mm diameter divide it into half is 37.5mm; so the result was the attached image, i just want to make sure if the bar bending radius (inner and outer) of the pipe is correct. OK. So, you already drew that sketch and want now to measure the elements to make sure they are the right size. The inner diameter should be 112.5 units (150 - 75 / 2), while the outer one should be 187.5 (150 + 75 / 2). The results from your screen-shot are from the fact that units in dimension style are set to display with no decimals. I suggest you to use either MEASUREGEOM or DIST commands instead for validation. Just pick the center of the arc and an arbitrary point (Nearest) on arc circumference. This will give you the size information with the number of decimals set in UNITS.